"I hate your guts. You know that?" With 2001's Rush Hour 2, Jackie Chan secured his status as an action superstar in America; he's now one of Hollywood's highest paid Asian actors, and his legion of fans is growing every day. New enthusiasts are eager to rediscover some of his earlier films, most of them produced in Hong Kong, and Columbia TriStar has slowly but surely been bringing them to DVD. Unfortunately, many of his early pictures, especially those produced under director Wei Lo, have dated quite badly. New Fist of Fury certainly has. In this sequel to Bruce Lee's Fist of Fury, Jackie Chan plays A Lung, a young thief who has little time for martial arts. He moves with his sister from Shanghai to Taiwan, fleeing oppression from Japanese forces. Taiwan is the home of the martial arts school of A Lung's grandfather, but even the school is not safe, as a ruthless Japanese kung-fu master wants to bring all such schools under his control, and he'll stop at nothing to accomplish his goal (even if it involves the murder of all the Chinese masters). A Lung is recruited to learn a new style of fighting, repel the Japanese invaders, and combat the oppression of the Chinese people. No one comes to Hong Kong martial arts films for the acting or the story (even the best of the bunch have confusing, vague, and underdeveloped plots)�they come for the action, heaps and heaps of it. New Fist of Fury has some decent fight scenes, to be sure, but they don't show up until 3/4 of the way through, and even then, they pale in comparison to Chan's later work (Drunken Master II in particular). The majority of the story is long on the talking, with plenty of inane dialogue and plodding story development. Even Chan isn't that fun to watch; it's surprising how whiny he is in these early films (and how often he gets beaten up). In fact, what interested me most had little to do with the story, but more with the fractured history of Hong Kong and Taiwan. They've always been under the control of foreign invaders, be they British, Japanese, or Chinese, and New Fist of Fury exists as an anti-Imperialist curiosity. Image Transfer Review: This 2.35:1 image really isn't all that bad, considering, though it has some big problem areas. The most obvious and irritating element is the condition of the source print, which shows near constant speckling, with the occasional line or scratch (there's even the occasional film dropout). There's a grainy look that is somewhat obscured by the overall softness. Colors are fairly dull, but black level is surprisingly good. Edge enhancement is visible, but not nearly so much as on other Columbia TriStar discs. I suspect this is just good enough to please martial arts fans, who are no doubt used to the poor image quality on most Hong Kong releases. Audio Transfer Review: Audio is offered in mono English and Mandarin. Neither seems to be the original audio (which should be, as far as I can tell, Cantonese). As it is, each track is of roughly the same quality. Overall, the presentation sounds very thin, with a lot of background hiss and distortion. Voices sound muffled and rough and unusually dubbed in (they are dubbed, of course, but good dubs don't sound like dubs). The music especially sounds harsh, particularly the score at the opening credits, full of screaming wind instruments. Extras Review: Extras are limited to a trailer gallery with spots for Gen-X Cops, The One, Crouching Tiger, Hidden Dragon and Columbia TriStar's typical bevy of subtitle options. Jackie Chan deserves his reputation as one of the greatest martial arts stars ever to come out of the Hong Kong film industry, but he made a lot of garbage on his way to the top. 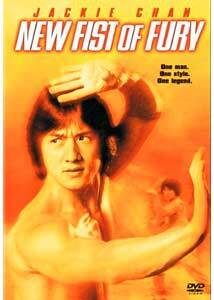 New Fist of Fury is dull, dull, dull, and there's little here to interested casual fans of Chan or chop-socky movies.